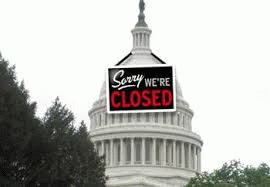 Both political parties have their own reasons for shutting down the government, so it should come as no surprise when the lights go off on October 1st. The Teabaggers who continue to manipulate House Speaker John Boehner made it clear to Mr. Merlot that they would have no part of any compromise bill that didn't include another fruitless attempt to de-fund the Affordable Health Care Act. The Democrats, however, are willing to stand their ground and might welcome a shutdown -- despite the negative consequences -- because they're banking on the fact that the public would place the blame where it belongs: on the Republicans. President Obama isn't a happy camper these days. He was dealt a serious blow when Larry Summers, his pick to replace exiting Fed Chairman Ben Bernanke, withdrew his nomination in the face of overwhelming opposition from liberal Democrats and women's advocacy groups. As Clinton's former Treasury Secretary, Summers was responsible for allowing bank deregulation that played a major role in creating our current economic crisis. His unpopularity with women dates back to his days as president of Harvard University, where he hypothesized that women were under-represented in the technological industries because of their inherent weaker abilities in math and science. Pretty dumb comment for a smart guy. "That's how the conservative editorial board of The Wall Street Journal described the current budget strategy floated by a number of conservatives in Congress: tying provisions to defund the Affordable Care Act to a 'must-pass' bill like the continuing resolution to keep the government open past Sept. 30 or the debt ceiling increase that may be needed by late October. "'Kamikaze missions rarely turn out well, least of all for the pilots,' the WSJ editorial board wrote. One House GOP aide called it a 'fantastical' plot with no real end game." And as always, the biggest losers are the American people who will suffer if/when the doors are locked on October 1st.